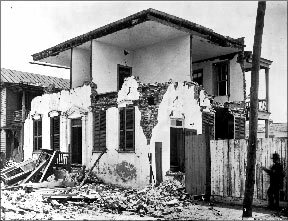 Damage from the 1886 Charleston earthquake. One hundred seventeen years ago, on August 31, 1886, one of the strongest earthquakes to strike the continental United States in recorded history hit Charleston, South Carolina. The 7.3-magnitude quake and subsequent fires killed 60 people and significantly damaged every building in what was then a city of only 49,000 people. In the past century, Charleston and its surroundings have grown considerably, and a major earthquake today could prove devastating to the half million people who live and work there. As can be expected, however, with very little seismic activity occurring in South Carolina in recent memory, earthquakes are no longer on the minds of average citizens. But the South Carolina Emergency Management Division (SCEMD) hasn't forgotten 1886, and it is prepared for another quake just as strong. Planning for and responding to disasters of any kind fall under the purview of the SCEMD. An arm of the state adjutant general based in Columbia, SCEMD develops and continually fine-tunes procedures for disaster mitigation, preparedness, response, and recovery with the objective of saving lives, reducing suffering, and minimizing property loss. 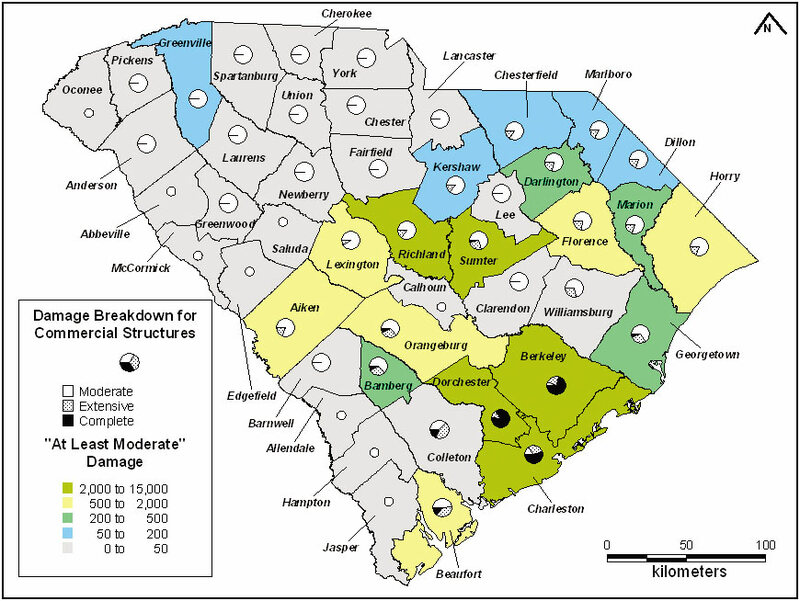 In 2000, SCEMD revamped its hurricane evacuation procedures and emergency shelter assignments to accommodate shifting demographics within the state. With so many real-life storm experiences to draw upon, SCEMD was readily able to predict where emergency resources would be needed under a variety of hurricane intensity and landfall location scenarios. "We felt ready to manage a hurricane, but we asked ourselves, 'What would our emergency needs be if an earthquake struck?'" says John Knight, risk assessment coordinator for SCEMD. "Given South Carolina's history, this question required serious answers." Other than seismic records from a century ago, South Carolina had little information on how a major quake would impact the state. Questions were posed such as "What buildings will be damaged?" and "How will transportation and utility infrastructure be affected?" Without these answers, SCEMD found it difficult to select evacuation routes, stockpile emergency supplies, and designate relief shelters in preparation for a major seismic event that could strike anywhere in the state with no warning. HAZUS estimates the degree and geographic extent of earthquake building damage across the state based on inputs of building use, type, and construction materials. To answer its earthquake questions, South Carolina looked to the U.S. Federal Emergency Management Agency (FEMA) in Washington, D.C. In 1997, FEMA released Hazards U.S. (HAZUS), a GIS-based software program that estimates and maps the regional damage and losses resulting from an earthquake of a given location and intensity. The results support planning for natural hazards mitigation and response by state, regional, and local governments. GIS is the ideal environment for earthquake loss modeling because it has the ability to analyze spatially distributed data such as demographics, the built environment, and infrastructure with a vast number of different attributes including quake magnitude, geological conditions, and structure type. Spatial analysis is essential to the mathematical and empirical vulnerability models of HAZUS, which require substantial processing power for the analysis of spatially distributed information. The first release of HAZUS was built on the ArcView 3.x platform. For the development of HAZUS Multi-Hazard (HAZUS-MH), an enhanced version that will be released in February 2003 with flood and wind models added, FEMA chose the ArcGIS platform. FEMA opted to use ArcGIS for the new version because the state-of-the-art Component Object Model (COM) technology provides a framework that allows HAZUS users to build upon the basic software, if they desire, by integrating additional applications from a variety of vendors. In addition, the ArcGIS Spatial Analyst extension provides the multidimensional analysis capabilities essential for the new software to model flood behavior and estimate flood losses in the built environment. ArcGIS Spatial Analyst enables users to conduct cell-based GIS operations on data sets to determine the depth and extent of floodwaters at specific points within a hazard study area. Knowing that an earthquake could strike anywhere in the state, South Carolina has simulated numerous size/location quake scenarios with HAZUS. SCEMD's Knight typically runs scenarios on his desktop computer, a Pentium IV with 512 megabytes of RAM operating on Windows 2000 Professional. The scenario that has been refined and studied most closely by SCEMD is a repeat of the 1886 Charleston earthquake. "The results are sobering," says Knight. "It became clear we must devise substantially different mitigation, response, and recovery plans for an earthquake than for a hurricane." If Charleston were struck by a 7.3-magnitude seismic event today, the software estimates that at least 800 bridges would be rendered impassable and 250 fires would be ignited. More than 300,000 households would be without power while 80 percent of residences would have no water service. Losses could be as high as $20 billion with 75 percent of the damage localized in Charleston, Berkeley, and Dorchester counties. Based on inputs of recent data on area building uses, occupancy classes, and construction type, the analysts estimated 69,000 homes would be uninhabitable, 30 of 108 hospitals would be too damaged to operate, and more than 25 percent of schools and 34 percent of fire stations would be closed by damage. Unreinforced masonry buildings would be hit hardest. "We obtained an excellent overview of impact to the community as well as estimates of localized damage," says Knight. 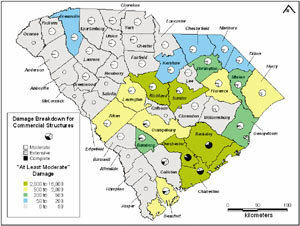 SCEMD has used these results to create a mitigation, preparedness, and response plan specific to earthquakes. This new earthquake plan is 95 percent complete and is being distributed to emergency personnel statewide along with maps generated by the GIS program showing evacuation routes over highways and bridges least likely to have sustained damage. For more information on HAZUS, contact Claire Drury at FEMA (tel. : 202-646-2884), or e-mail hazus@fema.gov. Kevin Corbley writes on GIS subjects.